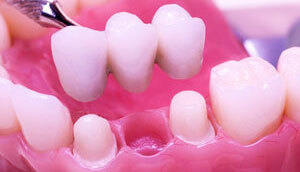 A dental bridge may just be your best solution if missing teeth are creating a gap in your smile. A dental bridge is a natural-looking device custom-made to fill that gap while preserving your teeth’s alignment. Even if you have a missing tooth people don’t see very often, getting that gap filled can be very important to both your chewing function and to your overall oral health. A bridge is used to replace a missing tooth. Dr. Flowers is an expert at restorative dentistry, which deals with the restoration of diseased, injured, or abnormal teeth to normal function. Dr. Flowers has more than three decades of experience and has created hundreds of bridges over the decades. He has completed hundreds of continuing education classes, including many classes in advanced restorative and cosmetic dentistry. Gaps between teeth can cause problems if not repaired. Missing teeth can cause chewing problems. Moreover, if even one tooth is missing, other teeth may slowly shift out of place, leading to bite and/or jaw problems. This changes the way your teeth fit together. So it is important to fill these gaps between teeth. A conventional fixed bridge is one way to accomplish this. A fixed bridge is made of a filler tooth that‘s attached to two surrounding crowns. Once complete, this bridge structure is bonded into the mouth. With a single dental implant there is no need to alter healthy surrounding teeth as with a bridge. Bridges work very well for patients who already have crowns, or who need crowns on the teeth around the missing tooth or teeth. However, if the teeth surrounding the missing tooth are in healthy condition, Dr. Flowers prefers to use a single implant to replace the missing tooth instead of a bridge. This is a more conservative solution since it avoids the unnecessary cutting of healthy teeth to place the bridge. In the long-term, dental implants are easier to keep clean and bacteria-free than a fixed bridge. They are also easier to maintain a more aesthetic appearance. Gums can recede around a bridge revealing its metal base, and resorbed bone under the bridge can cause a gap in your smile. 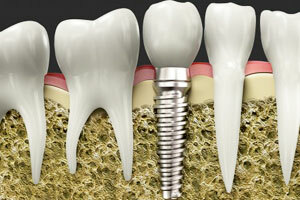 Dental implants are placed directly into the jawbone so there are no such issues. 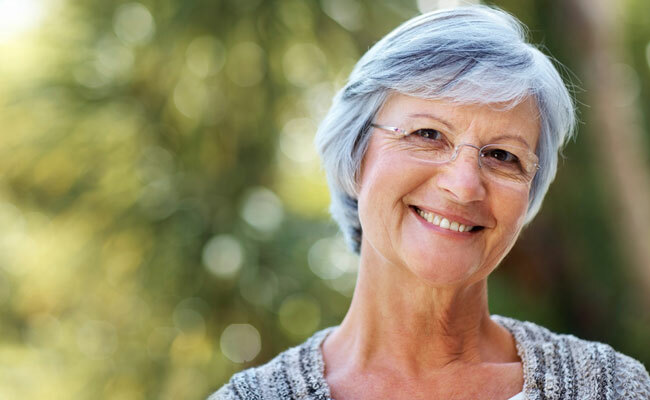 Click here for more Options for Missing Teeth. 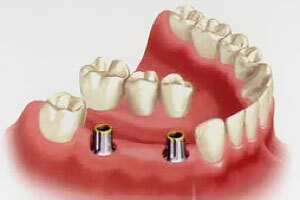 When you are missing several teeth in a row and implant-supported bridge is a great option. Implant bridges don’t require an implant for each missing tooth. With an implant-supported bridge, also known as fixed partial dentures, the bridge is supported on either side by a dental implant. The number of dental implants necessary for a full-arch bridge varies. A bridge supported by dental implants is permanently fixed into place. It replaces the support lost by the missing teeth while avoiding the need to drill adjacent teeth, as is needed with conventional dental bridges. Read more about Implant-Supported Bridges.